"Is the media liberal?" is a question that readers and viewers often ask because politicians routinely make that accusation, especially during election years. While it's common to hear claims of liberal media bias, it takes a closer examination to uncover whether they are true. Because politics is a blood sport, any time the news media reports a story perceived to be negative against a candidate or government leader, there's often an immediate accusation that the reporter, her editors or corporate owners are "out to get" the helpless politician who's only trying to help the people. It's more common to hear accusations of liberal media bias, rather than conservative media bias. The media misconception that some people including politicians try to convey is that in media companies across the country, there are secret meetings that take place, where reporters are given orders on how to slant the news so that there's a liberal political benefit. Before a story is published on-air, online or in print, it's distorted so that liberal political viewpoints are promoted, while conservative beliefs are suppressed. Claims of liberal media bias go back decades. The Nixon administration said the news media was biased against the U.S. war in Vietnam and the constant negative reports were taking a toll on U.S. military efforts. During his election campaign, Presidential candidate George H.W. Bush called reporters "mournful pundits" for describing his sputtering 1980 campaign. During the 2008 presidential election, media outlets were criticized for helping Barack Obama win the White House while portraying the John McCain and Sarah Palin in a poor light. The Katie Couric interview that skewered Palin is one example that conservatives point to that gives evidence to their claims. News reporters did indeed criticize U.S. military efforts in Vietnam. CBS news anchor Walter Cronkite, one of the 10 TV legends, returned from a trip to Vietnam to say the war was not winnable. It was one of 12 events that changed news coverage. But President Lyndon B. Johnson, a liberal Democrat, was still in the White House. So Cronkite's analysis would have been critical of a liberal politician, not a conservative one. Also, evidence shows Cronkite had not set out to doom U.S. chances in Vietnam since his earlier reports had been positive. As for the 2008 presidential campaign, media attention focused on the Democratic race for president because of its historic nature. The nominee was either going to be Barack Obama or Hillary Clinton. The storyline was more exciting than the contest on the Republican side. As for the Katie Couric interview that skewered Palin, liberals have long argued that Couric's interview wasn't tough at all. For example, Couric merely asked what magazines and newspapers Palin read, and Palin responded with "all of them" and wouldn't provide a specific name, making the vice presidential candidate appear uninformed. But while some say Republican nominee John McCain did not get favorable coverage, he had long been considered a favorite of news reporters. Part of that was because of his "Straight Talk Express" bus during the 2000 election. Reporters had nearly non-stop access to McCain as they all traveled the countryside during that year's Republican primaries. When discussing allegations of liberal media bias, it's important to define the media. Hollywood stars, like liberal George Clooney, aren't shy about expressing their political views or working to elect candidates. Oprah Winfrey is credited with giving Obama the boost he needed to overtake Hillary Clinton in the 2008 Democratic primaries, although she faced a backlash from some viewers for turning her back on a female candidate. However, Clint Eastwood has long favored conservative candidates and spoke at the 2012 Republican National Convention. Neither Clooney nor Winfrey is bound by the same ethical standards of traditional news reporters, who are well advised not to get too chummy with political candidates. Talk show hosts, like Rachel Maddow of MSNBC, present slanted TV programs that shouldn't be considered straight news. While she's politically liberal, she's offset by Sean Hannity and other conservatives on Fox News Channel. 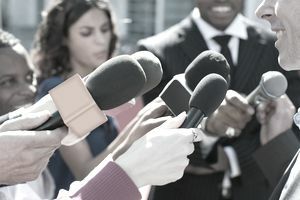 Traditional news media outlets sometimes present news stories that are critical of presidential administrations or campaigns, as Cronkite did generations ago. Those reports must meet standards of accuracy and balance, to avoid accusations of bias. For those working in news media, part of being a watchdog over government officials is withstanding criticism. For viewers, getting news from a variety of sources, even from talk show hosts with opposing viewpoints, assures exposure to all sides of political issues.